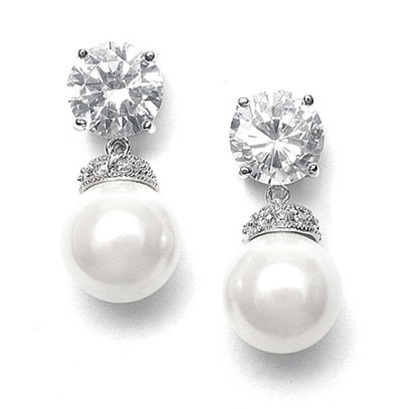 * Mariell's classic round shaped CZ wedding earrings have a bold pearl drop. * These wholesale vintage pearl earrings are great for the bridal or bridesmaids. * Mariell's classic round shaped CZ wedding earrings with a bold white pearl make an elegant bridal or bridesmaid earring. * These lovely earrings have a vintage rondel pearl cap and are plated in silver rhodium and measure 3/4"h.